An international team of astronomers, including a University of Southampton expert, has discovered a new type of explosion in a distant galaxy. The explosion, called PS1-10adi, seems to prefer active galaxies that house supermassive black holes consuming the gas and material around them. 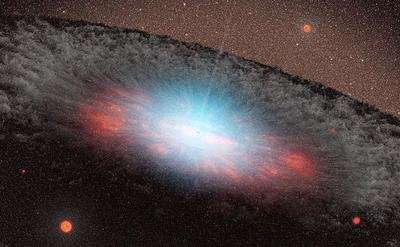 Using telescopes on La Palma and Hawaii, the team detected an explosion that was so energetic it must have originated from one of two sources: an extremely massive star – up to several hundred times more massive than our Sun – exploding as a supernova, or from a lower mass star that has been shredded by the ultra-strong gravitational forces close to the supermassive black hole. The explosion – detailed in a study published in Nature Astronomy – occurred 2.4 billion years ago, but the enormous distance that light from the event had to travel to reach Earth meant it wasn't observed by astronomers until 2010. The slow evolution of the explosion allowed scientists to monitor it for several years. Artist's impression of a supermassive black hole. Fermi's Large Area Telescope (LAT) detected gamma rays -- the most energetic form of light -- from the nova for 15 days. Scientists believe that the emission arose as a million-mile-per-hour shock wave raced from the site of the explosion. A nova is a sudden, short-lived brightening of an otherwise inconspicuous star. The outburst occurs when a white dwarf in a binary system erupts in an enormous thermonuclear explosion.